Holywood_Bob has told us about the location of the photograph - "it is a shot of the opening of a store called johnny cupcakes on newbury st in Boston. it is an indy tshirt shop." Click here to go to the Jonny Cupakes website. This is not a confirmed event yet at either place, but it does seem likely that either the Johnny Cupcakes shop, because of the photograph, or the poster museum is the venue given the nature of what we are searching for. More information will be posted here when we know more. A possible Johnny Cupcake design idea ? So three possible locations, I am assuming for the moment that Johnny Cupcakes is the location given the photo on the hub page. But does that mean the next item will be a tshirt ? Anyone in Boston that can go down to either location ? agreed, the other "Hint" was an exact location and event. Just like this will be on wednesday. This is not much of a game. In terms of layers of complication then yes there only appears to be one ! However it doesn't mean we can't have some fun along the way, and there are some other things happening like the odd spacings and extra pixels on some of the pictures on the hub page. I went to bed after my last post so that's why this is so late. 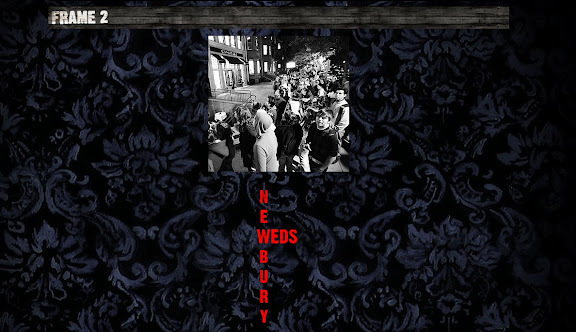 Lisa, yes I put the Newbury comics site on the main post, but I personaly don't think it will be there. I've been to Boston and found it was like most large cities, it has it's good and bad points. yes it does, it's a pain to get around unless you know how and where to park. Not fun ! Johnny who owns Johnny Cupcakes used to work at Newbury Comics. "as well as a record shop called "Newbury Comics". They have about twenty-something locations (in which I ended up getting my pins sold through). Almost every day when I went into work, I was given a different completely random nicknames for no reason what so ever"
Sounds like Sawyer was working there ! This paragraph is interesting too zort. During the last day of the trade show I saw a lot of kids wearing the same sneakers as I had on. I said to myself, "I don't like having something that everyone else has". Which got me thinking... maybe I shouldn't have my shirts all over the place? People like what nobody else has. I decided then, to keep my shirts out of chain stores, and to be very very selective of which shops I'd like to carry my brand. In addition, I decided to make all of my t-shirt limited and exclusive. Some shirts more limited than others...some shirts even numbered! Deciding upon this was probably one of the most valuble decisions I've made for my company. It makes it more than just a t-shirt line. It's collectible, limited, wearable art. The bold tags are mine. I looks like we may be getting different mediums of art from TPTB. I agree that things are pointing in the direction of the T-Shirt. 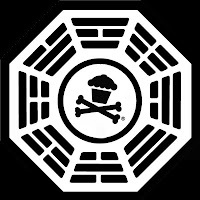 So are we going to get the Dharma Cupcake station ? lol you're faster than me zort. Here's where the pic originated. can't play today. so if t, i hope some left by days end. So will be signing? To bad you can't play today. Maybe there won't be much going on. See you tomorrow for sure. LotteryTicket, that is a good find, it is a bigger version of the one on the story page on the Johnny Cupcake website. Sayid'sGirl we are on the same wavelength today ! Looking at the way the T-Shirts are packaged, I wonder if the box will also be a Lost related item ? This is assuming that the T-Shirt is what is going to happen. Assuming so. Yes that would be cool. Maybe it would be a fishbiscuit. lol That's about the only thing not in the auction. Just seen this article about a Lost Numbers T-Shirt on the Hide your arms site. Good work on beginning to narrow this down. Maybe there will be another hint later today! I'm not sure about the t-shirt idea...otherwise why are there empty frames, unless they frame a t-shirt? In the description of what the 16 pieces of art will be...silk-screened posters seem to be the final version of whatever art is created by these designers and artists. So maybe the artwork from a t-shirt will become a poster. He mentions he's been working a lot in his Boston store lately! "I'm now going through my notebooks of designs, concepts and ideas. Working on everything 3 years in advance. Ties, hand bags, toys, silk screened #'d posters, housewares, sneakers, jackets & a lot of surprises to come! " So I gather he puts his designs on a number of items including numbered posters! This does sound it! Good work everyone. Well I'm glad they gave us another clue- that is Johnny Cupcakes, otherwise LOST fans would've invaded the International Poster Gallery! Maybe Jack or Christian will be there since they are the Red Sox fans. Can't wait to see the new one! The trouble is the clue is still a bit vague. Does it mean the art will be available on Wednesday. Will there be a launch event at some point ? Does someone have to go to the shop from opening to closing time just in case ? Does anyone find the main poster on the Poster Gallery site is an illustration of a polar bear in a mustard company advertisement? Polar bears? Mustard? Actually its ketchup? Just a thought. 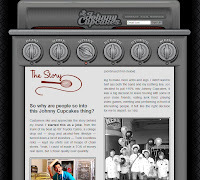 Johnny Cupcake website history now includes the photo from DCaaPB plus another which clearly shows store front. Yeah that's definitely on wood. Maybe it will be a sign in the window or somewhere outside or inside the store. this looks to me like color pencil hatching. Maybe crumbs from a cupcake? The logo might be in water or on fabic. Maybe an island beach? Is there a way to determine "time of posting" for images? Just wondering if there is a pattern developing. Or, are TPTB are reading this very blog and feeding us as needed. I've added the new clue to the main post, not sure it tells us anything though, apart from the art is going to be related to Dharma in some way. Has anyone spotted the hair in the photo ? Sloppy of them to leve it there, but it does tell us that this is a real thing, not a painting. Unless they have painted a hair onto it ! LotteryTicket, I think those photo's were there before. I saw it and just couldn't bring myself to post a comment about it. Vincent? I don't know what this latest piece of the puzzle tells us....definitely not when something is going to happen tomorrow (like the first one did). Maybe later there will be more! Vincent - I think it is more of a brunette than a blonde ! I'm going to get some sleep now, keep on commenting, especially if there is another clue posted. Just as I refreshed for the final time a new clue appeared. zort- did you get the newest? "Tell them Horace sent you?" it updated again with date 8/26 and time 10am EST. Thanks Scoutpost, I've updated the main page. I'm definitely going to bed this time. Now hey, some Lost or DHARMA skateboard art is something that I could get into! Oh My..Johnny Cupcakes has been doodling.. In the words of Sawyer, "Is that what they're calling it these days?" Okay, that's 7AM PST tomorrow! 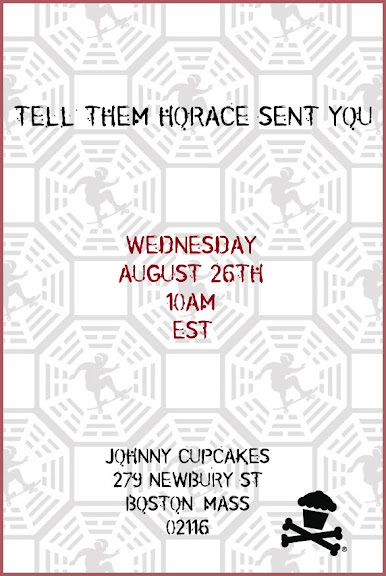 Over at Dark's they're saying if you go into the store and say "Horace sent me" they'll give you a piece of Dharma spongecake! See what happens when I take a nap. I'm not use to getting up early again now that school has started back up. Tony Hawk is an Other. This is a post from DarkUFO. Well at least I'll be able to stay awake to follow this event. That is if there will be someone to follow like we did Hollywood_Bob. There's quite a few posters over at Dark's that said they live nearby...one lives around the corner! I'll have to keep an eye out on whose going to go and if they're going to post/twitter post pics or what. Did we have any early clues that the poster would be of Hurley? Just wondering who/what the theme will be this time. I guess the clues would point to Locke. The puzzle and Horace sent me. I still don’t understand the skateboarder though. I really want to go but if it's just to get a piece of cake and then a hunt around a town I don't know, I'm not sure I would like to go. Hummm still thinking about it. Lisa: I understand your hesitance! The Hollywood thing was close to me, but I wasn't comfortable going into Hollywood night clubs alone late at night. There is a skateboard shop on Newbury across the street from Johnny Cupcakes. Just a note Johnny Cupcakes in public alley 432 < numbers. 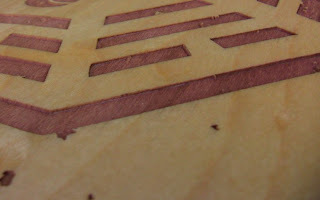 The Dharma logo is the skater in the background you can see it on the stencil picture..remember this is a reverse image. He sells limited edition teeshirts. Hi all. I have nt posted anything since Find815. But I live in MA and I will go tomorrow. If I can figure out this twittr thingy Iwill let you know so anyone can follow if they want. Lisa, I hear ya! This better be a little more than Dharma spongecake. But I am up for a scavneger hunt. Not sure why that is not working. And i can't delete it. Sorry but i am on twitter. Yeah...Johnny Cupcakes sells t-shirts, not cakes and baked goods...so don't go there expecting a yummy treat. Not sure why they decided on skater art...unless maybe you have to go on a hunt to find the skater Dharma logo to find the actual LOST art. Guess we'll know soon enough. Hopefully I'll be able to follow along, but 10:30 in Boston will be 7:30 here, right in the middle of getting kids ready and off to school. Hi, sorry. I left my cell phone on my work desk. My daughter said it's okay if you follow her, she will be posting updates as things go on. Eugene, my bf said he knew we were going so I guess we will be there. If you see a tall blonde with a grizzly hairy guy, that's us. I've turned into a woose in my older age so were just going to go for it and hope that there is parking somewhere close by. Shoot. I live in Boston but cannot make it there because of work. I've been to Johnny Cupcakes, its really cute. If it's a scavenger hunt I can't imagine they would make people go to Newbury Comics though because its a few blocks up. Oh well we'll see! Checking in for email. (My work computer blocks blogger.) Hope I can check in around 10 am tomorrow. Lisa: Do you guys have a twitter acct? Thanks, Eugene, following your daughter! I'll be on first thing in the AM to follow along as long as I can (having a group over @9:30AM to work on a quilt). Hope most of it is over by then! you know, I think I might back out on going. I'm such a woose !! I'm looking at the street view and the parking is minimal and us with a huge truck sure won't squeeze in to a small space they show on there. I also have to be here at 3 for my son and it's a 2 hour drive to get there - one way. It would be rush hour too. Don't worry Lisa, I'm sure we will have it covered one way or another. MILES: LaFleur's busy. Horace sent me instead. I'm in the circle of trust. We are heading into JCC's in about an hour. I hope it's not too crazy in town. I can't find a weather or traffic report on any channel since the passing of Sen Kennedy is getting non-stop coverage here. Camera is charged. Coffee is made. I haven't been this excited since I got an Apollo bar. Oh my gosh. I haven't turned on the news yet. I knew it was probably close but I didn't expect it now. Eugene, have fun! Thank you and please keep us updated! I've created a NEW POST for todays hunt.